Alfa Romeo has one of the most bizarre logos and stories. 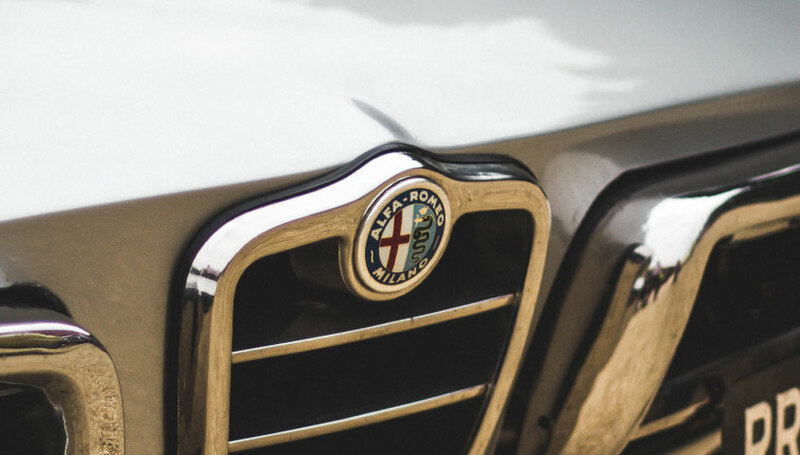 The Alfa Romeo logo is the official branding of the Anonima Lombarda Fabbrica Automobili, which was designed to directly represent the Biscione which is family coat of arms of the Visconti, one of the most influential and respected families of Milan. One half of the badge depicts the flag of Milan to emphasize the fact that the company’s Milanese heritage. The Biscione heraldry shows a crowned viper eating a Moorish baby. Weird. The badge has been subtlety redesigned several times since 1910, most recently in 2015 with a new typeface and the colours have been reduced from four to three: the green of the biscione, the red of the cross, and the dark blue of the surrounding ring. Other changes include the absence of the split white and light blue fields, replaced by a single silver textured background. Aston Martin began life as Bamford Martin, named after the company’s founders. The name was soon changed to Aston Martin in recognition of the company’s success at the Aston hill climb. At that time the logo was simply an amalgamation of the A and the M in a circular badge. In 1927 the AM logo was completely reformulated into the something closer to winged logo we know today. The first wings were much more V shaped than the modern badge and over the course of the 20th century a variety of adjustments have been made to make their car badges the suave and sophisticated symbol we have become accustomed to. The four rings of the Audi badge represent the four marques of Auto Union which was a joint enterprise in the 1930s between Audi, DKW, Horch and Wanderer. The design is believed to be by Klaus bon Örtzen, the sales director at Wanderer who was inspired by the decision to have Berlin host the 1936 summer Olympics. Over time the other manufacturers faded and left the partnership and in 1985 the Auto Union brand ended after a short association with Neckarsulm car maker NSU and Audi became the sole brand remaining but kept what was by now a very recognisible logo. This German car giant’s iconic badge has a rather simple meaning behind it. The circular logo evolved from the Rapp Motorenwerke company logo from which the BMW company grew. The famous blue and white check inside the circular badge comes from the Bavarian flag and unsurprisingly the B in BMW stands for Bayerische or Bavarian Motor Works. Ferrari is one of the most recognisable brands in the world, the Cavallino Rampante or little prancing horse is known in every country. The prancing horse shield is depicted with S F underneath for Scuderia Ferrari or Team Ferrari and the green, white and red of the Italian flag at the top. Road cars have a rectangular badge without the SF and optionally have the shield on the front wings. On 17th June 1923 Enzo Ferrari won a race at Savio in Ravenna where he met the influential Countess Paolina, mother of count Francesco Baracca, an Italian air force ace in WWI. Baracca used to paint a prancing horse in red on a white background on his aircraft as this was part of the Baracca family crest and Countess Paolina requested Enzo to do the same to his racing cars in his memory. Enzo dutifully obliged but painted the horse black as a sign of grief after the pilot was killed in action and added canary yellow as the background which is the colour of the city of Modena where Enzo was born. Noticeably Enzo also depicted a horse with the tail raised while Baracca’s pointed downwards. Ferrucio Lamborghini liked bulls and was a Taurus himself. That’s about it. He liked them so much that he named the iconic Miura after Don Eduardo Miura, a renowned breeder of Spanish fighting bulls and even unveiled the 4th car built to Don Eduardo at his ranch. Porsche have another typically German, straight forward badge from the company responsible for the no-frills sports car. The badge incorporates the coat of arms of the state of Württemberg and the coat of arms of Stuttgart where the company is based. Want to own one of the finest motor car badges ever conceived? 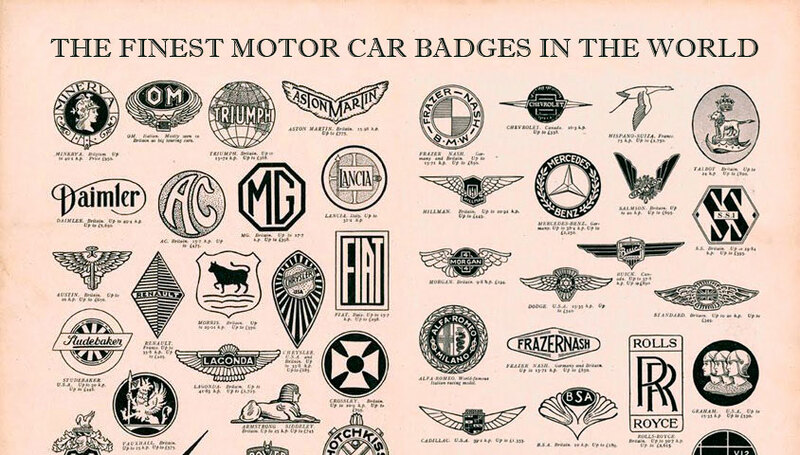 Order your own Classic Motor Hub Badge in our online shop today!